SCADA Pro OCP is a module of SCADA Pro, representing a generic real-world optimum design computing platform for civil structural systems. SCADA Pro OCP is a module of SCADA Pro, representing a generic real-world optimum design computing platform for civil structural systems. In order to be applicable in the everyday practice, it is implemented within an innovative computing framework, founded on the current state of the art of optimization. It covers all construction materials that CSI products support such as reinforced concrete, steel, aluminium etc. Advanced and easy to use interface, making structural optimization a single button click process. 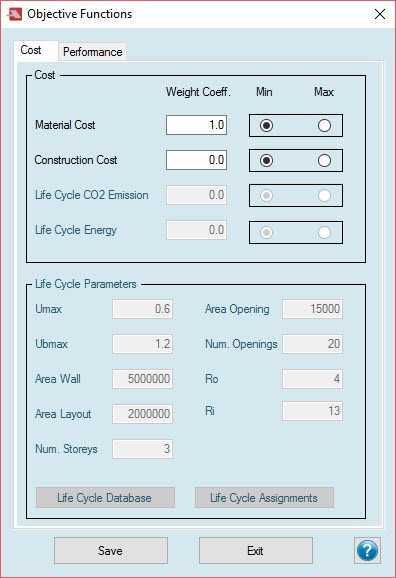 It offers the possibility to select multiple criteria, related to the construction cost, environmental impact, etc. ; which can be used either as “Objective Functions” or “Additional Constraints”, further to those imposed by the design codes considered. 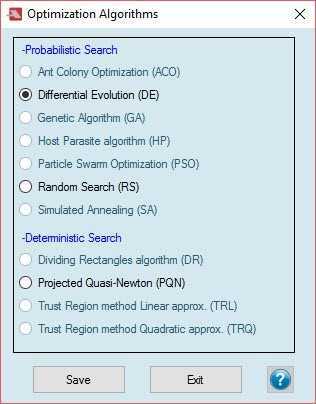 Solution using algorithms selected from a list of state of the art numerical optimization algorithms. Multiple options to define the design bounds of the design variables; either at section or element level. Comparison of initial and optimized designs. Structural optimization has matured from a narrow academic discipline, where researchers focused on the optimum design of small-idealized structural components and systems, to become the basis in modern design of complex structural systems. Some software applications in recent years have made these tools accessible to professional engineers, decision-makers and students outside the structural optimization research community. These software applications, mainly focused on aerospace, aeronautical, mechanical and naval structural systems, have incorporated the optimization component primarily as an additional feature of the finite element software package. However, these tools fall short of meeting the needs of the professional engineer. ACE OCP was developed in order to fill this gap by offering a holistic optimization approach in terms of final design stage for real-world civil engineering structures such as buildings, bridges or more complex civil engineering structures. Optimization is the act of obtaining the best result under given circumstances. In design, construction, and maintenance of any engineering system, engineers have to take many technological and managerial decisions at several stages. The ultimate goal of all such decisions is either to minimize the effort required or to maximize the desired benefit. Among others, using ACE OCP, construction and material cost reduction can be achieved. Engineers always strive to design efficient structural systems which must be as economic as possible yet strong enough to withstand the most demanding functional requirements arising during their service life. The traditional trial-and-error design approach is not sufficient to determine economical designs satisfying also the safety criteria. 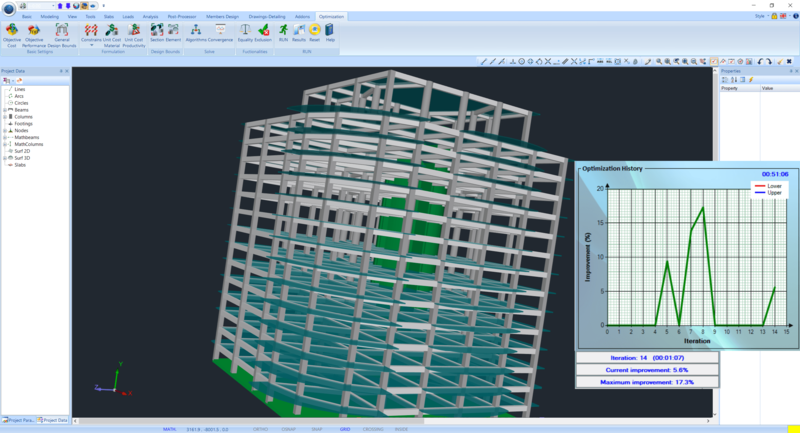 Structural design optimization, on the other hand, provides a numerical procedure that can replace the traditional design approach with an automated one. 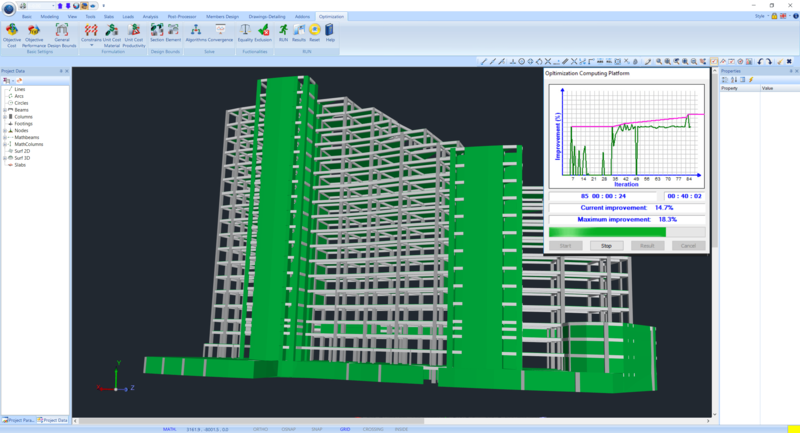 ACE OCP plugin provides a complete optimization approach in terms of final design stage for real-world civil engineering structures such as buildings, bridges or more complex civil engineering structures. The scientific and technical oportunities adopting ACE OCP plugin in the design practice are enormous, but so are the issues at stake. The main goal for the implementation of ACE OCP plugin is to help new generations of engineers to design safer and economic structures within an affordable and reliable technological framework. In the past, various numerical optimization algorithms have been presented aiming to meet the demands of structural design optimization. Ten state-of-the-art optimization algorithms are available in this innovative CSI plugin all of which have been successfully tested in various challenging problems. ACE OCP’s strength lies in the broad range of built-in capabilities and ease of use. 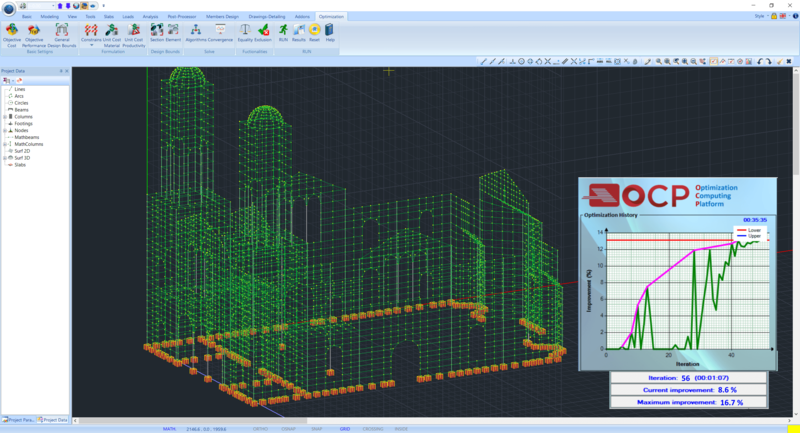 For the first time a plugin ensures a bright future for optimization methods and their use into the mainstream of structural engineering practice. Within the construction industry, there is constant pressure to deliver projects more effectively on multiple fronts. This is most notable in the desire to reduce project time scales, while also consistently increasing capability and design quality. ACE OCP will provide significant added value to the users of SAP2000 and ETABS and an instant payback. There is no need for additional information. In order to ensure that the results obtained using the ACE OCP plugin are, directly, comparable with those implemented in the initial model by the user, the same FE simulation, material properties, loading conditions and design codes are considered for the repeated procedures of analysis and design. This is implemented by using the same binary input file (SDB or EDB file) in the application of ACE OCP plugin for the generation of the new models. 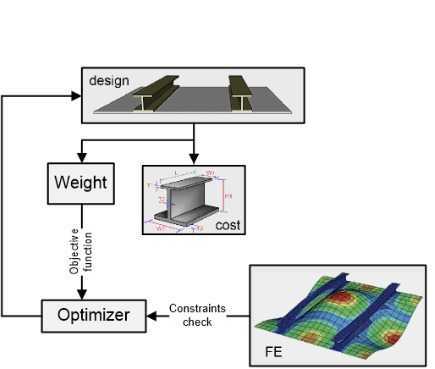 Design optimization refers to the process of generating improved designs in terms of cost, manufacturability or performance without compromising safety. Structural optimization problems are characterized by various objective and constraint functions that are generally non-linear functions of the design variables. ACE OCP supports various objective functions. The implementation of optimum design formulations to real-world problems requires significant computational effort which can only be addressed with the synergy of cutting edge technologies in the field. Therefore, the tools required for dealing with structural optimization problems basically must serve four purposes: (i) accurate numerical modelling of the structural system, (ii) robust structural analysis for calculating response quantities such as displacements and stresses under various loading conditions, (iii) precise design procedure for performing the constraints checks imposed by the design codes and/or the design engineers and (iv) efficient optimization algorithm for achieving optimized designs that satisfy both design requirements and economic, manufacturability or performance criteria. ACE OCP harnesses technology to drive efficiency, increase performance and reduce cost while preserving safety excellence. ACE OCP is the result of over 20-years of Research and Development including practical experience in developing a general-purpose code for structural analysis and design optimization in the form of a modular standalone code, and co-developed by ACE-Hellas and the Institute of Structural Analysis and Antiseismic Research of NTUA. The methodologies integrated into ACE OCP plugin have been approved with the publication of the theoretical framework and indicative results in the official Journal (http://goo.gl/cZIbgB) of the International Society for Structural and Multidisciplinary Optimization (ISSMO, http://www.issmo.net). ACE OCP is based on the next generation computational procedures and the implementation of such computing tools is expected to have a profound impact in optimized design of structural systems, leading to revolutionary changes in civil engineering design practice. Effectively, it makes value engineering available to every professional engineer. ACE OCP plugin has been successfully implemented in a variety of real-world structural systems, leading to cost reduction of up to 30%. Among others it was used for optimizing the Beijing National Stadium (Bird’s Nest) and the Beijing National Aquatics Centre (Water Cube) where ACE OCP produced design improvements leading to a cost reduction of 10%. In other projects ACE OCP delivered improved designs to drive better structural performance while maintaining the same financial allocation.